Manila Water’s communication programs win Anvil Awards | Manila Water Company, Inc. Receiving the awards were company officials led by Manila Water Group Head for Corporate Strategic Affairs and Corporate Communications Department Head Jeric Sevilla, Laguna Water General Manager Shoebe Caong, Quality Assurance Department Head Arlene Go, along with Provincial Administrator Atty. Dulce Hilario Rebanal of the Provincial Government of Laguna, and other Manila Water representatives. 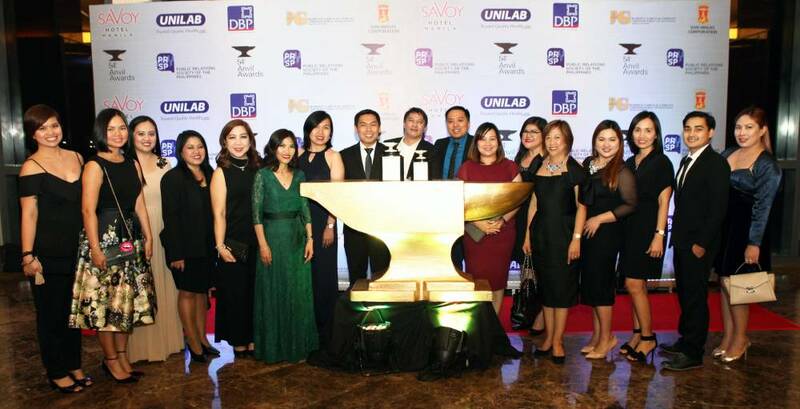 Ayala-led Manila Water bagged two Anvil Awards at the recently held 54th Anvil Awards of the Public Relations Society of the Philippines (PRSP) held on January 30 at the Marriott Grand Ballroom, Newport Boulevard in Pasay City. Manila Water’s outstanding program, “QX Academy: Creating Shared Value and Sustainable Quality Execution through Skills and Training Development for Partner Vendors," received a Silver Anvil Award for the PR Program Directed at Specific Stakeholders category. Considered as the Oscars of public relations and the most coveted prize in the industry, an Anvil Award is a testimony of an organization’s commitment for continued excellence in PR practice. The Anvil Awards is judged by a distinguished multi-sectoral jury. Each year, hundreds of entries from both public and private institutions nationwide are thoroughly reviewed and assessed by about 40 PR professionals and a panel of over 30 jurors.